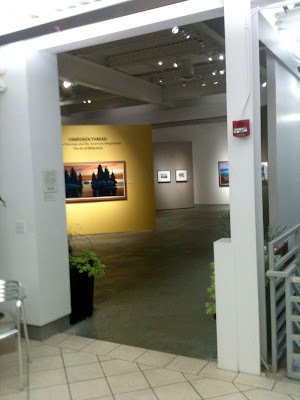 Here's the entrance to Saginaw Art Museum's current exhibit of my paintings. Unbroken Thread: The Art of Philip Koch (through Feb. 19, 2012). The photo is taken from the beautiful glass enclosed walkway that leads from the Museum's original 19th century Mansion house to one of its new wings. Below I've turned around and photographed the doorway to the walkway currently full of handsome metal sculptures by David Holtslander. At the right is my oil The Voyage of Memory, a piece inspired by the 19th century American painter Thomas Cole's series of four paintings, The Voyage of Life (I had the pleasure of seeing them again just last weekend down at the National Gallery of Art in Washington, D.C.). At the left is my oil Otter Cove, which I'll return to later. 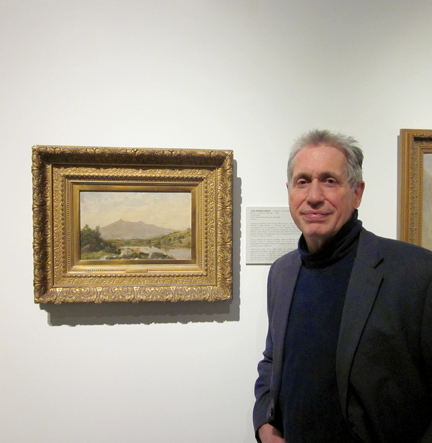 Below is me posing with an oil by another of my early favorite artists, the American John F. Kensett. It's Study for the Lakes of Killarny, that Kensett painted in 1856 while on a trip to Ireland. The Museum hung about a dozen landscapes by 19th and 20th century painters alongside my own work to provide some historical context. The show, after all, is called the Unbroken Thread. Here's a better view of their Kensett. 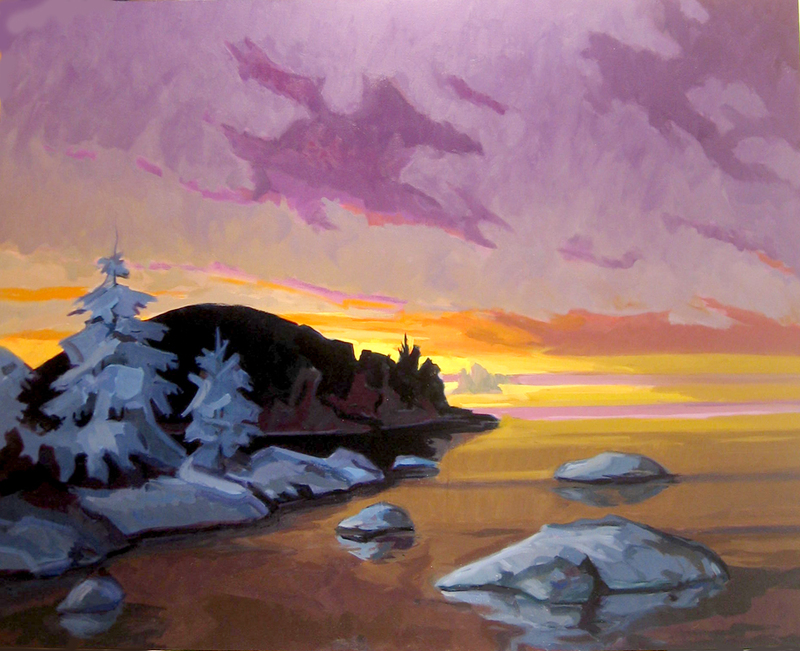 He was a huge influence on me when I was taking my first tentative steps into landscape painting in the Fall of 1970. Indiana University Art Museum had a wonderful Kensett. It was a coastal scene that reminded me of the rocky beach where I grew up on the shore of Lake Ontario, just outside Rochester, NY. In particular I loved the silvery greys he used on his prominent rocks. I did a copy of it from life right in the Museum, the first time I'd ever done that. Saginaw Art Museum's Kensett has a lot of that same feeling to the light. Below on the left a photo my wife Alice took of me in the Fall of last year during our 13th residency at Edward Hopper's former painting studio on Cape Cod. At the right is my large oil Otter Cove. 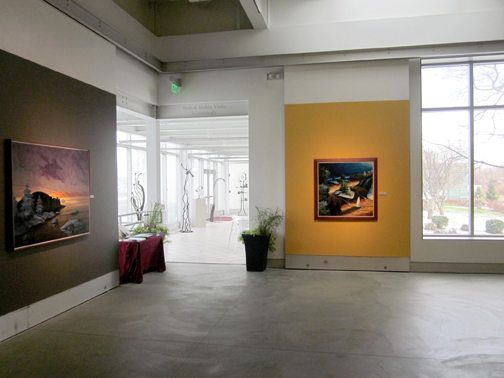 Below is another view of the 50 painting exhibition with the same oil,Otter Cove, at the far right. 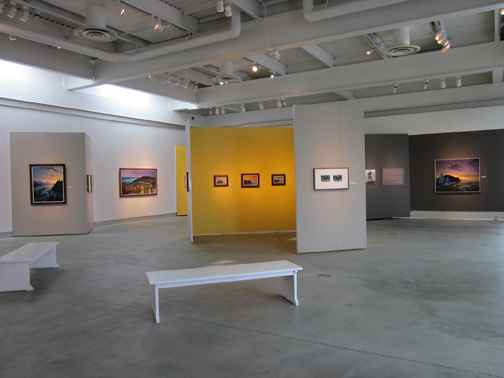 Saginaw's gallery space is huge. Here's Otter Cove. It's 44 x 55" and was inspired by my many trips to Mt. Desert Island in Maine. 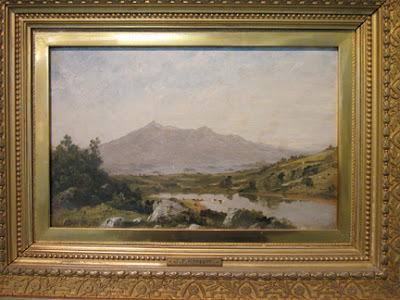 Frederick Church, the 19th century American painter did one of his famous oils at the same spot on the Island, but his view turns to look at the mountains. I worked on this oil by looking at a vine charcoal drawing I did on the spot looking the other direction, out to sea. As the painting progressed I played around with the forms considerably until I was happy with the result. One of the changes I made was to cover the foreground with heavy snow. Partly that's because I grew up up North, and snow was (and is) such a big ingredient in my imagination. But also in the back of my mind are some other painters who celebrated snow and winter. As the Winter Solstice is just past, I should show one of them. 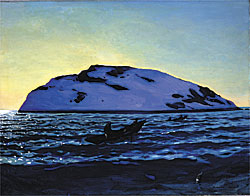 Here's Rockwell Kent's painting Afternoon at Sea, Monhegan, from 1907. 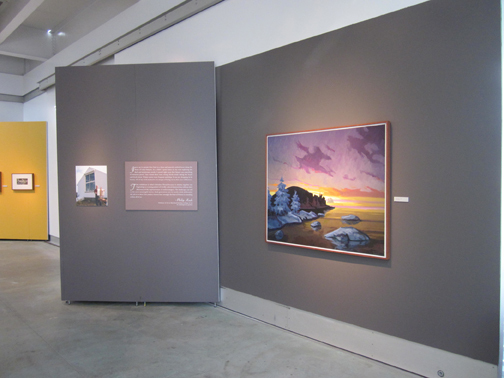 I have several of the drawings I made of Monhegan Island in Maine in the exhibition. Rockwell Kent of course wasn't the sissy I am. He moved to Monhegan Island in northern Maine and built three houses there (one of which was later purchased by Jamie Wyeth), worked as a lobster man, and painted some of the finest plein air winter paintings in American Art history. It looks so cold out there!